When you think about walking around a city, most people immediately think big-time … New York City, Boston, San Francisco and the like. 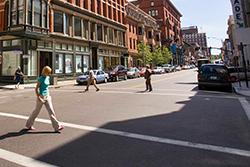 Contrary to popular belief, there are a vast amount of smaller cities that are on the list of the “most-walkable” in a recent article by the Huffington Post and Providence is one of them! There are so many hidden treasures in the city that we pass up because we subject ourselves to cars, cabs, buses and bikes. If we took the extra time and used our feet to get around this gorgeous city of ours, we would see so much more. One of my favorite walking tours of Providence is the Independence Trail. In your travels throughout the city, you may notice the painted green lines along the sidewalk. These lines lead you on the Independence Trail&apos;s historical tour of Providence, which I highly recommend. Park your cars and use your feet – you never know what you may find!